How dental implants from your dentist in Windsor Locks, Connecticut can improve your smile. Would you like to fix the gaps in your smile? Are you tired of living with missing teeth? The answer is dental implants! Dr. Thomas Yanik at Yanik Dental in Windsor Locks, Connecticut wants to share how dental implants can improve both the look and the function of your smile. When you have gaps due to missing teeth, you may have difficulty chewing the foods you love. The poor chewing ability can cause digestive issues, which can impact your overall health. When you are missing teeth, it also puts extra stress on your remaining teeth, which can cause breakage and damage. An impaired chewing function isn’t the only problem when you have missing teeth. You also have an incomplete smile, which can make you self-conscious about smiling. You may be ashamed of your smile, which can cause you to lose self-confidence. Highly successful; they boast a success rate of over 95 percent. Naturally beautiful; they are virtually indistinguishable from your natural teeth. Completely stable; they are embedded in bone, locked in place so they won’t move around when you eat and speak. Totally convenient; you brush and floss them like your natural teeth. 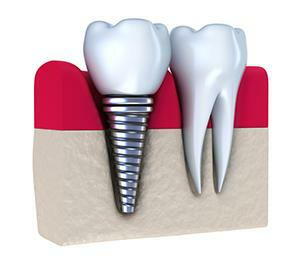 Your dental implant appointment begins with a simple in-office procedure to place the titanium implant screw. Titanium is biocompatible so your body won’t reject it. Instead, your body creates more bone to fuse with the implant screw. After the implant screw is fully embedded and your tissue is healed, Dr. Schechter will place a sparkling implant crown on top of the screw, and you have a new tooth! You can look forward to a lifetime of restored chewing ability and a beautiful smile. To learn more about closing the gaps in your smile with dental implants call Dr. Thomas Yanik at Yanik Dental in Windsor Locks, Connecticut. Get started on your complete smile by calling today!